Viacom acquired the Teenage Mutant Ninja Turtles from The Mirage Group and 4Kids Entertainment in late 2009 for US$60 million and the resulting new TV series debuted on September 29 on Nick in the US with a two-episode double-header. When Ciro Nieli found out Nickelodeon had bought the Turtles he knocked on their door with a pitch for a new TV series. He wasn’t the only one, but what swung it for Nieli, who’s previous credits include Super Robot Monkey Team Hyperforce Go!, Transformers and The Avengers: Earth’s Mightiest Heroes, was his pitch. The original black and white comic book series was dark, brooding and violent, although the series and movies that followed were lighter in tone. “I did look at the comic a lot and in the show we try to make use of the shadows and darkness, but I also understand the difference between an indie comic book and children’s programming,” Nieli says. The producers have recruited well-known stars to voice the half-shelled heroes. Jason Biggs (American Pie) is Leonardo; Sean Astin (Lord of the Rings) is Raphael; Greg Cipes (Teen Titan) is Michaelangelo; and Donatello is voiced by Rob Paulsen, as with the original TV series, which ran from 1987 to 1996. At Comic-Con Nieli met the expectant Turtles enthusiasts. “The fans are an eclectic and vociferous bunch,” he says. “I’ve been working on it for three years and at first they were sceptical and protective of something they love, but I think they have come to trust me and recognise that I don’t work on things that I don’t understand and care about. Paramount, a part of the Viacom empire like Nickelodeon, is making a new live-action Turtles movie that will be directed by Michael Bay and launch next year. Movie or TV, all roads stretch back to the early 1980s when Peter Laird and Kevin Eastman created the property. Nieli says a lot of what he has done with Turtles harks back to their work and he spent time with Eastman in particular. Eastman, for his part, says he and Laird have always been surprised by the huge success of their creation. “For us every step of the way has been a surprise,” he says. 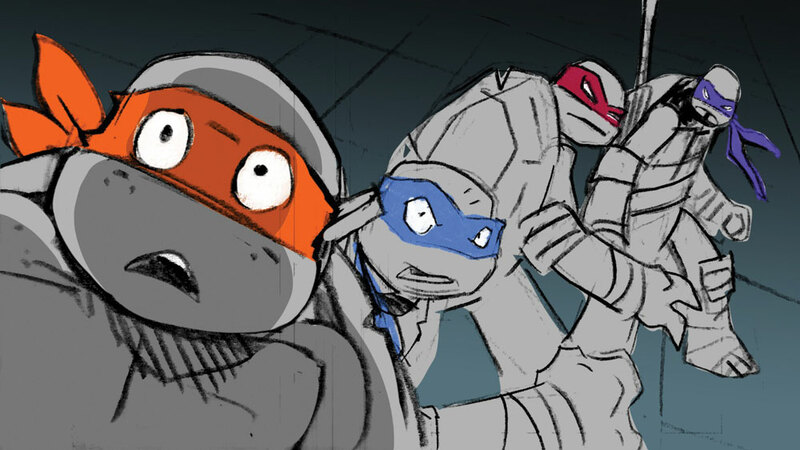 “When I drew the first Turtle I never thought we would sell one single version of the comic. I was surprised when that happened and when the success continues I am more surprised. Eastman and Laird had an unusual degree of control over how the characters were developed early on in their lives as the work went through their own studio, Mirage, which retains some publishing rights. Eastman says Nieli showed him drawings and ideas and, in a nod to his status as the creator of Turtles, nicknamed him Obi Wan [Kenobi]. Obi Wan evidently approves of Nieli’s work. He says: “He has the same approach to the series that we had to the comic and he’s taken everything we imagined and taken it further. Hands down, this is the definitive Turtles. It is constructed on everything that has gone before, but looks better in terms of the backgrounds the depth, there are 20 blocks of depth when they run across a building. Viacom International Media Networks has pre-sold it to Spanish public broadcaster TVE, which will air it from May. It launched the series at MIPCOM.